I have no recollection of taking this photo. I came across it yesterday in a pile of ‘to scan’ shots that had been lurking on my desk for a while. How could I not remember this marvellous scene – elephant family against Maasai Mara backdrop of the Oloololo Escarpment? 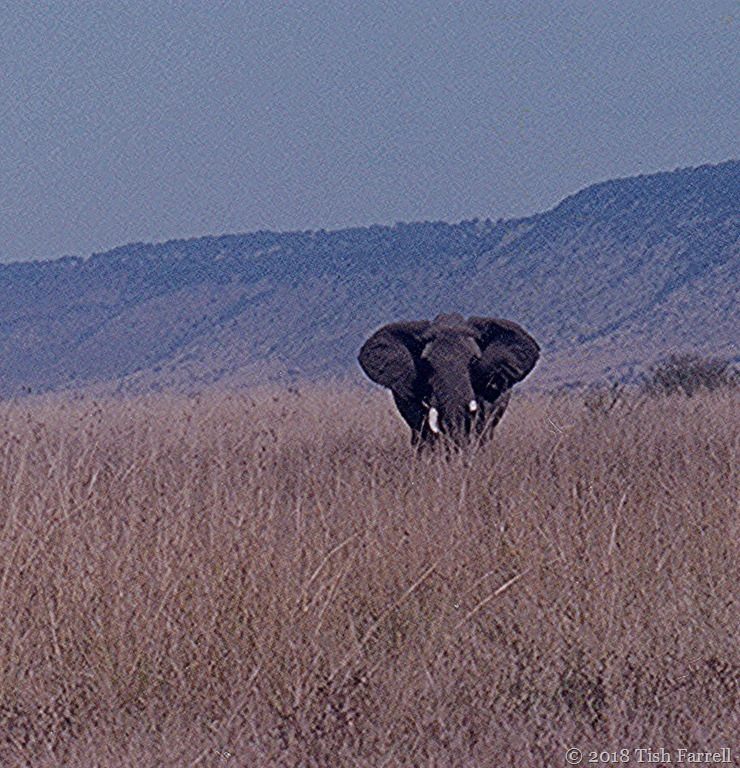 Not only that (and I know elephants are short-sighted) but the one left-of-centre, possibly the matriarch, seems to be looking straight into my lens. And the ears are out, which is not usually a very good sign. Fortunately, though, the trunk is not up. When that happens, swift retreat is definitely called for; an angry elephant can flatten a truck. We must have driven on and left them to their peaceful browsing. Time is of the essence; it takes a lot to fill an elephant every day – 300-400lb (135-180kg) of grass, reeds and tree parts (grass is their preferred food and they actively deforest areas to encourage grasslands, which may explain the broken tusk) and 30-60 gallons (135-270 litres) of water. A full time job then, seeing to those creature requirements. For more about elephants see the previous post. 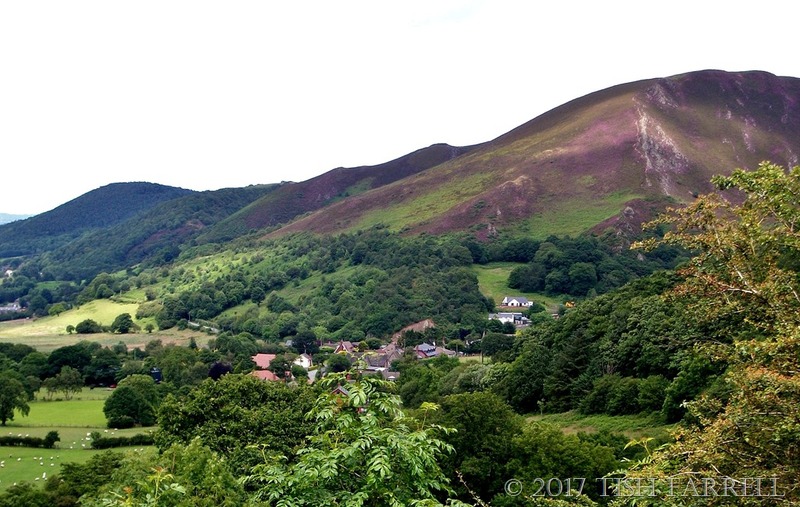 This photo was taken at Snailbeach Mine in the wilds of the Shropshire Hills. 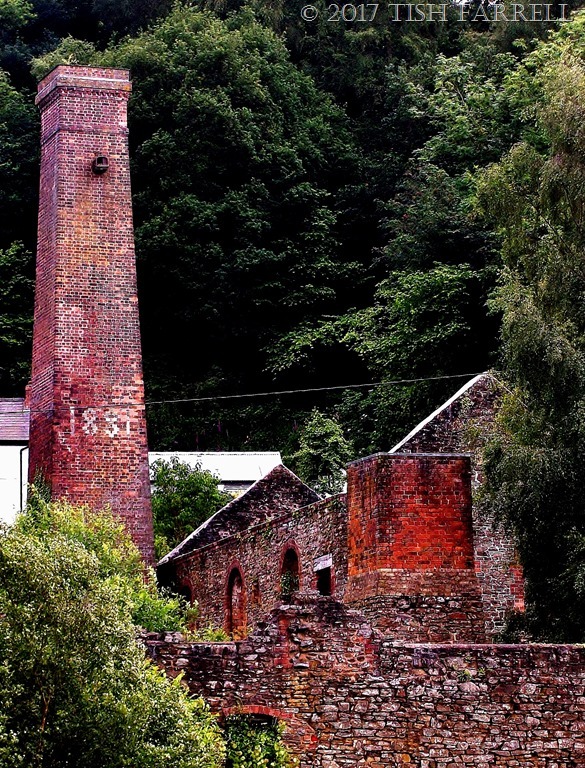 From the 1780s through the nineteenth century this was the most productive lead mine in the world, employing over 300 workers. But the history of lead mining in the area is much older than this, and for centuries the mineral was mined all over the nearby Stiperstones hills. The Romans were certainly here. They left behind a great lead ingot weighing over 87 kilos and impressed with the inscription ‘IMP HADRIANI AVG’. This meant that not only did it belong to the Emperor Hadrian, but also that Snailbeach was an imperial mine between the years of his rule, 117-138 A.D. The Romans used lead for water pipes, cooking vessels, paint and to sheath the hulls of ships. Of course some of these purposes proved highly toxic to the users. 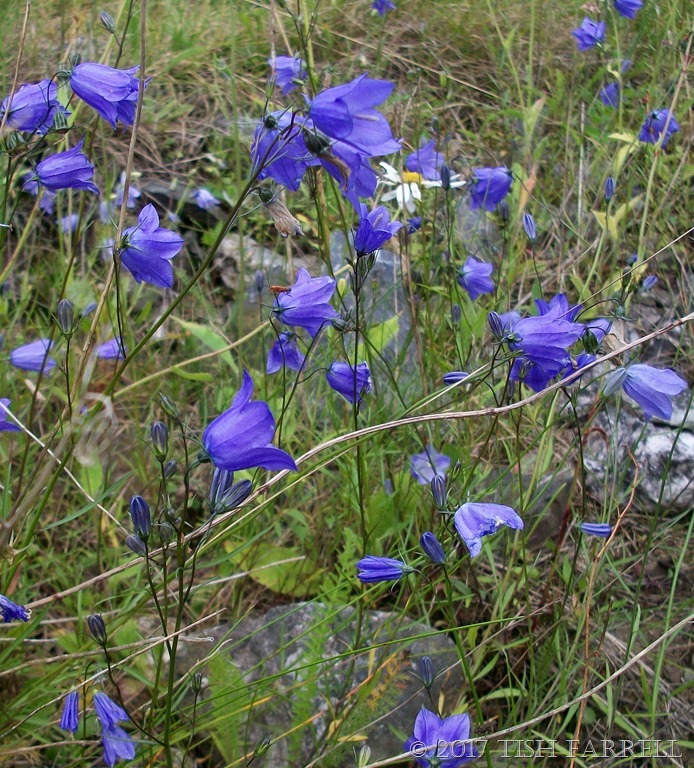 And it is now hard to imagine an association between something as hard, industrially wrought and poisonous as lead and these delicate harebells that seem to thrive on the waste ground near the mine ruins. In fact this whole area, with conservationists’ help, has been so reclaimed by wildlife it is now part of the Stiperstones Site of Special Scientific Interest. The birdlife of the area includes red grouse, ravens, buzzards, peregrine falcons, curlew and the rare ring ouzel. There are grayling and green hairstreak butterflies, fox and emperor moths. The vegetation includes heather, cowberries, whinberries and rare mountain pansies. It is so heartening, isn’t it, when so much on the planet seems environmentally challenged. Here in this corner of Shropshire at least, the natural world has overcome – reclaiming this once poisonous, highly industrial environment. For those of you interested in mining history there is more about Snailbeach HERE and HERE. 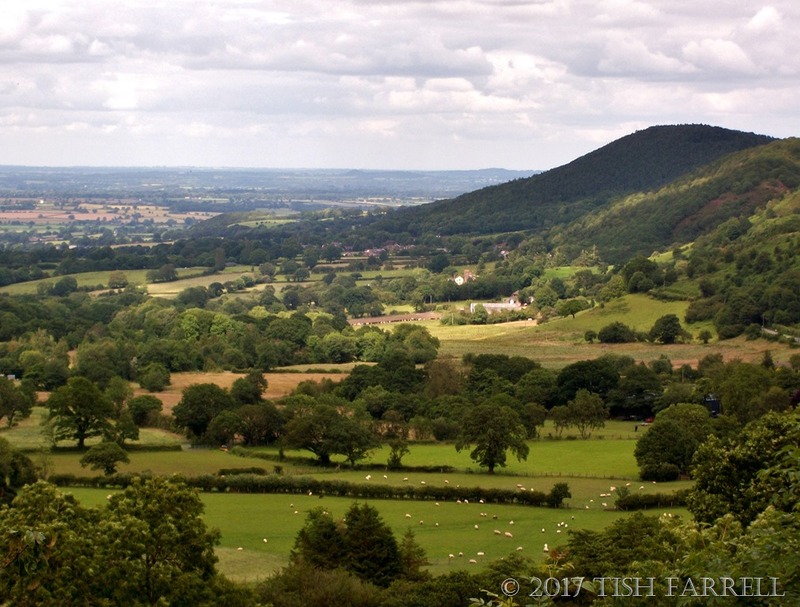 The latter link includes lots of useful teaching information and has a great video of aerial views of the area, which is anyway worth a look if you want to see more of this fascinating part of Shropshire. 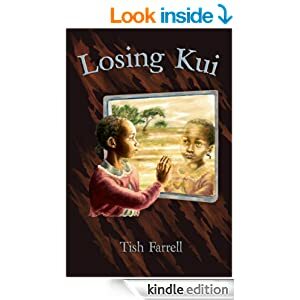 This week’s Daily Post photo prompt induced a ‘long ago when we lived in Africa’ moment, and thus a nostalgic trawl through the old photo files. It was giraffes I first thought of. They may seem an ungainly composite of various creatures, but to see them moving across the plains is a sight that cannot be forgotten. They lilt in time to some inner rhythm of their own. This is more apparent when you see several moving together. 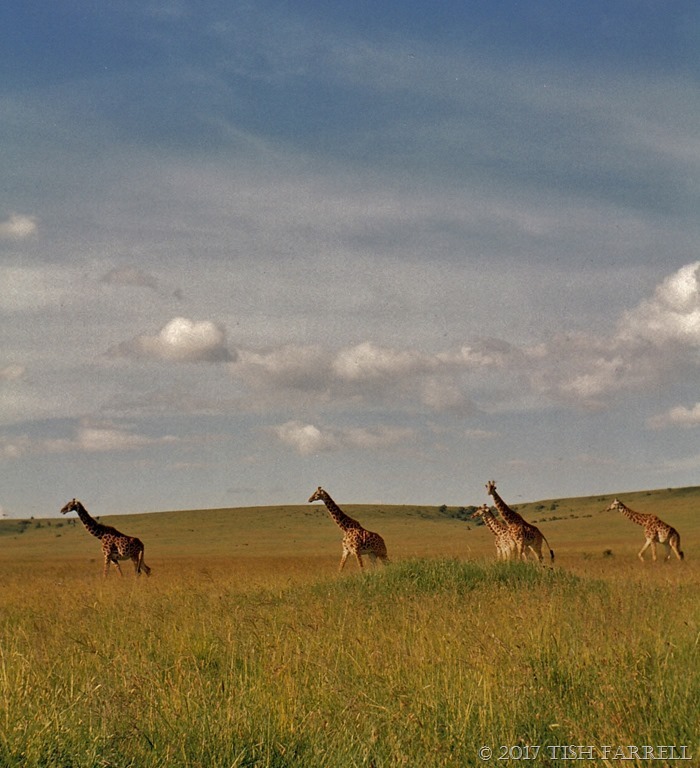 And you wonder what is this giraffe music, beyond your hearing, that they stride forth to with such synchronicity? 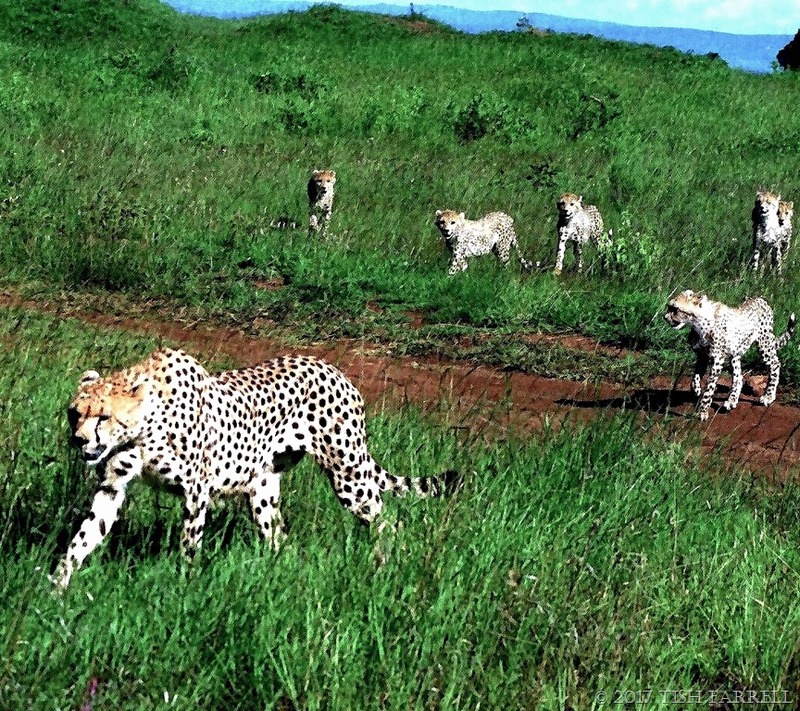 This cheetah mother with six half-grown cubs, walked out of the undergrowth beside the park track. When we stopped the car to watch she didn’t so much as blink at us. It seemed we were the least of her problems. She was trying to make the cubs stay in one place while she went off to hunt. But they were not having it. No sooner had mama parked them and moved out sight, than one (there always has to be one) goaded the obedient ones out of the cover that had sheltered them until they all decided to follow. 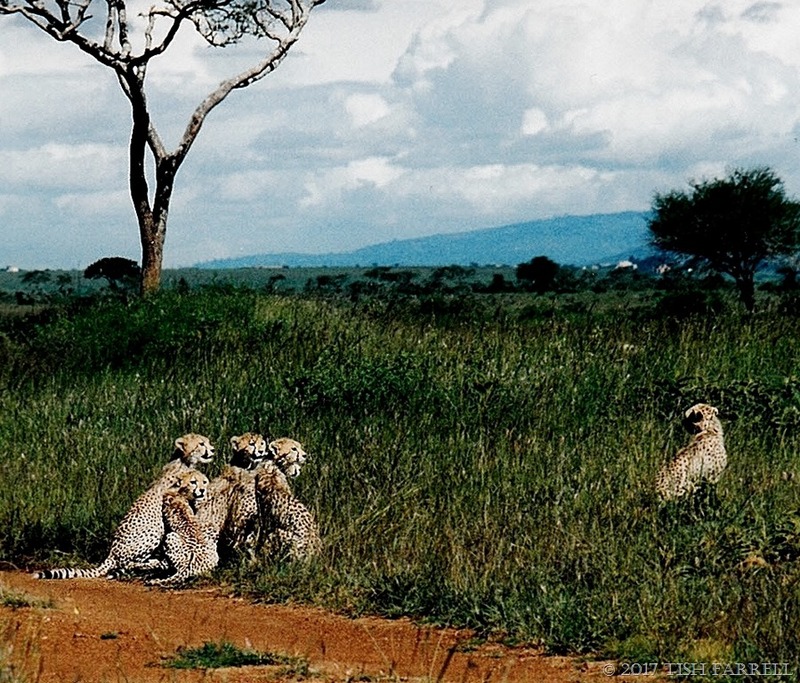 In the end, mama gave it up as a bad job, and gathered the offspring and disappeared into the bush. It is a mystery how she had ever managed to rear so many teenage cubs. 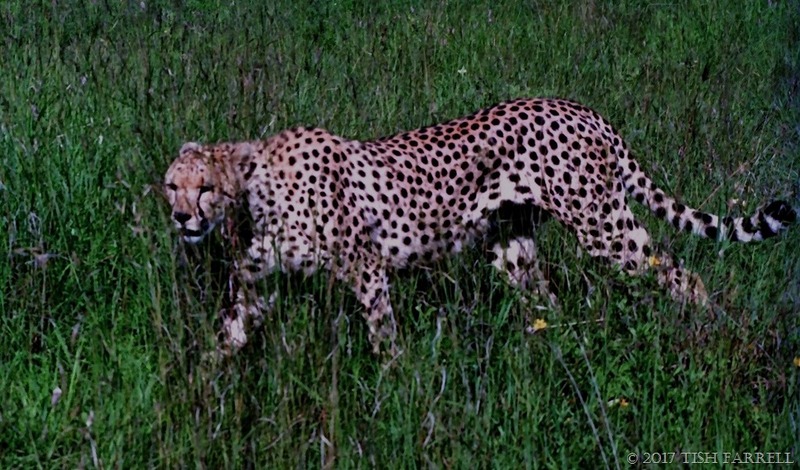 These photos, sadly ageing, were all taken in Nairobi National Park, a gem of a park that borders the city. 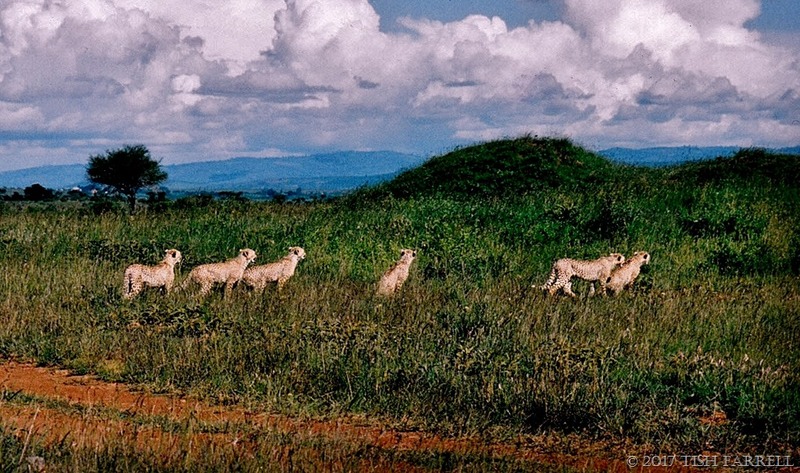 It covers only 46 square miles, but when we lived In Nairobi during the 1990s the wildlife corridor to the south was still open, allowing for seasonal migration. Today there are all kinds of pressures from one of the fastest growing conurbations in Africa – the need for farm land and for better transport links. 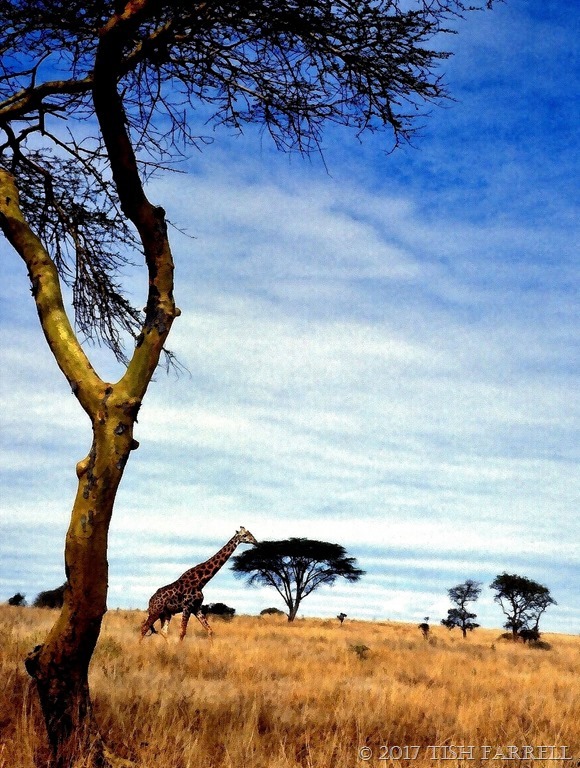 It’s a thorny issue however you look at it – wildlife versus humans: probably no happy solution; gracefulness seems not to be a natural human trait. 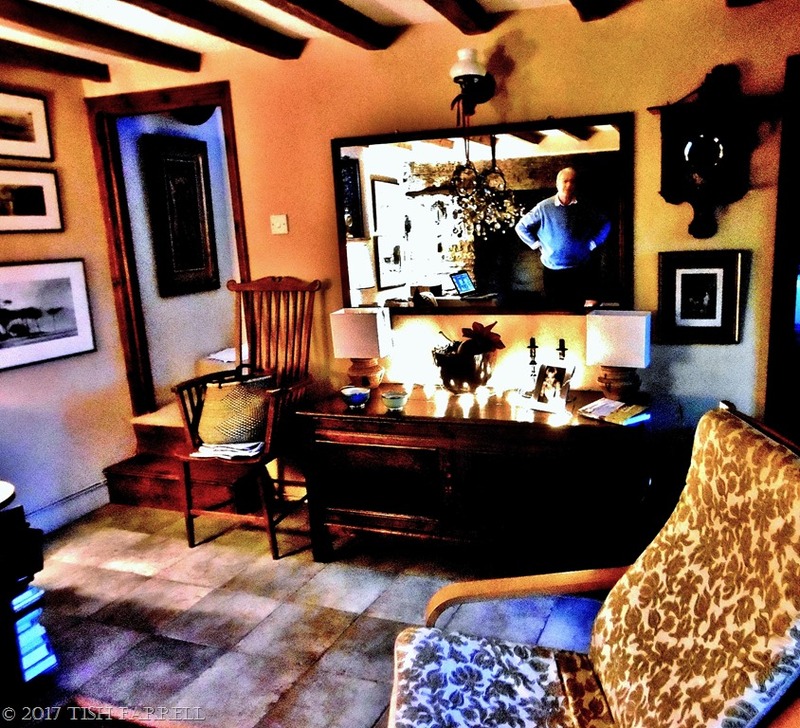 We don’t know a great deal about the history of our cottage. 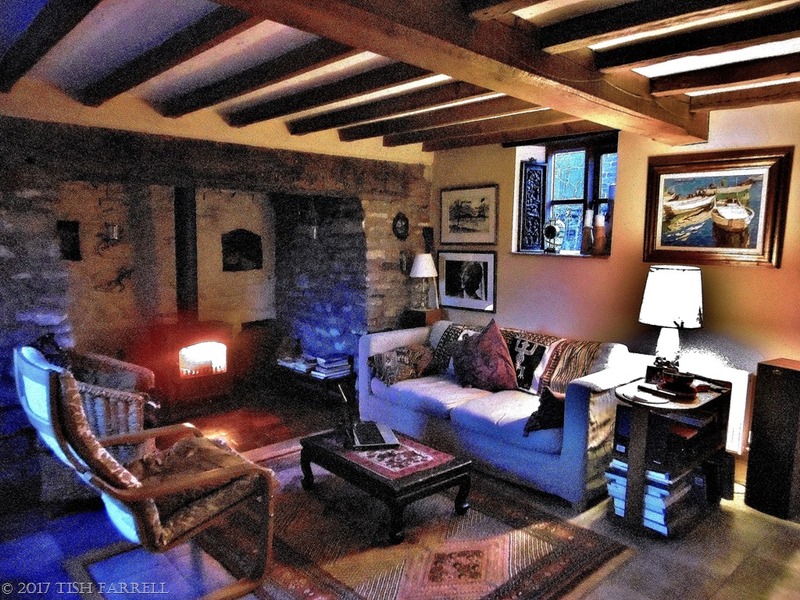 It seems it was built around the 1830s, and this room, with its large fireplace may have been some kind of workshop. The window was added in the 1980s after the place had been condemned, and then pretty much rebuilt. Originally, the back of the house was butted against the field bank – without footings or a proper floor. The privy was at the top of the bank beside the field, and to reach it you had go out of the front door, round the house and up the garden. Back then, too, the house was basically a barn, the upstairs subdivided into two rooms with thin boards, and downstairs probably one open space. The owners who did the restoration work turned it into a two up, two down, and added a small upstairs bathroom. The next owners built on another room up and down, and installed the spiral staircase which featured in an earlier post. 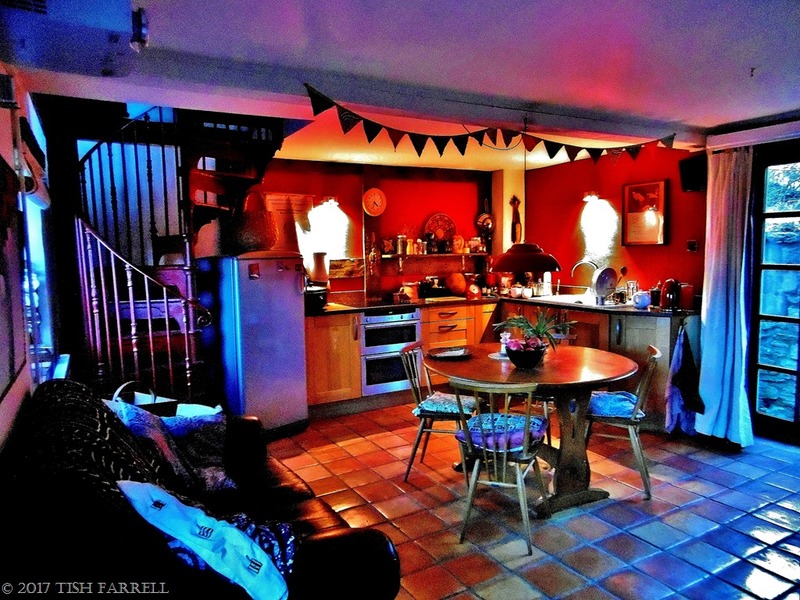 When we moved in ten years ago, we turned the new downstairs room, which hadn’t been used for any particular purpose, into the kitchen. The heart of the home of course. Which reminds me – I’d better scoot back there. I left some stock cooking on the stove about an hour ago. 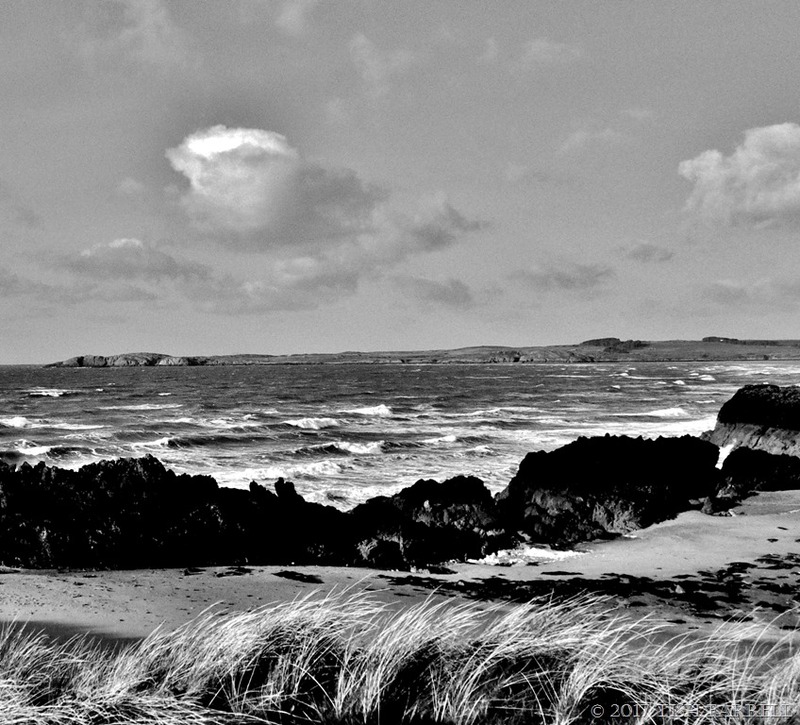 It was blowing a gale, wind like ice on our faces. 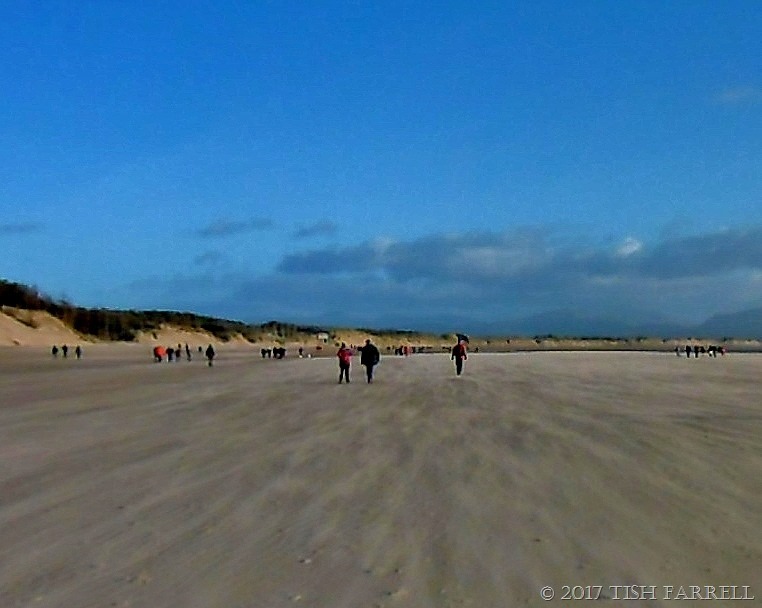 But that did not stop us – nor a hundred like-minded souls, all intent on the secular pilgrimage of walking off Christmas Day excesses, giving the family dogs a much needed airing, and heading to Llanddwyn Island while the tide was on the ebb. Anyway the sun was out, the light crystal bright, and the mountains of mainland Wales across Menai Strait looking their dreamy best. So why wouldn’t you head for the sea shore. 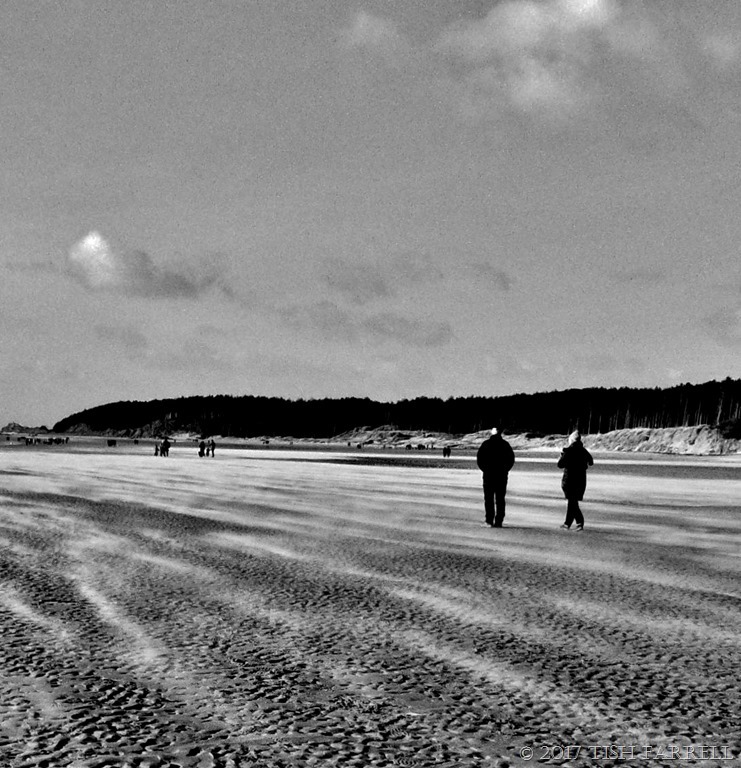 Newborough Beach was positively crowded. Not only that, the sands were coming to meet us as we set off to the island. It was the strangest experience, which along with eyes full of wind-tears played havoc with one’s perceptions. It was rather like going backwards on a forward moving pavement. And so at this point, seeing a chap on a bicycle seemed most surreal. 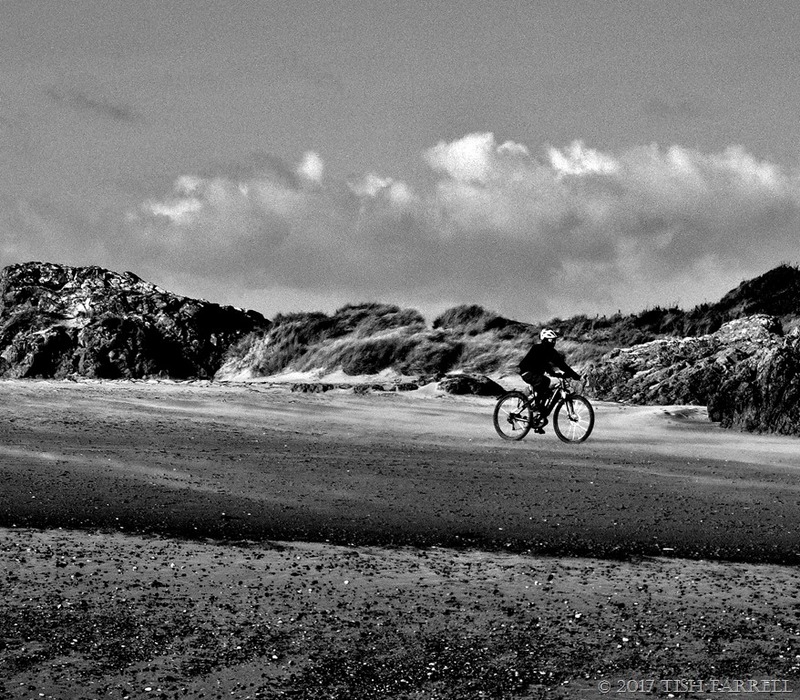 But then why not ride your bike on the beach? So much space. No grouchy motorists on your tail. All that sand for a soft (well soft-ish) landing. 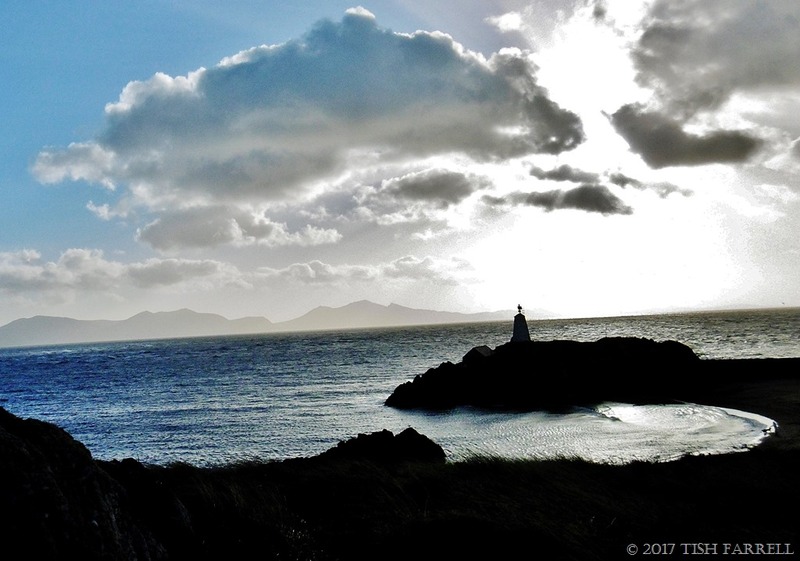 I’ve written about Llanddwyn (roughly pronounced ‘hlanthwin’) Island before. We were here two years ago, on Christmas Day, but then the tide was too high for us to reach the island. In fact it is not an island at all, but a long, slender peninsula, poking out into the Irish Sea like some dragon’s tongue. 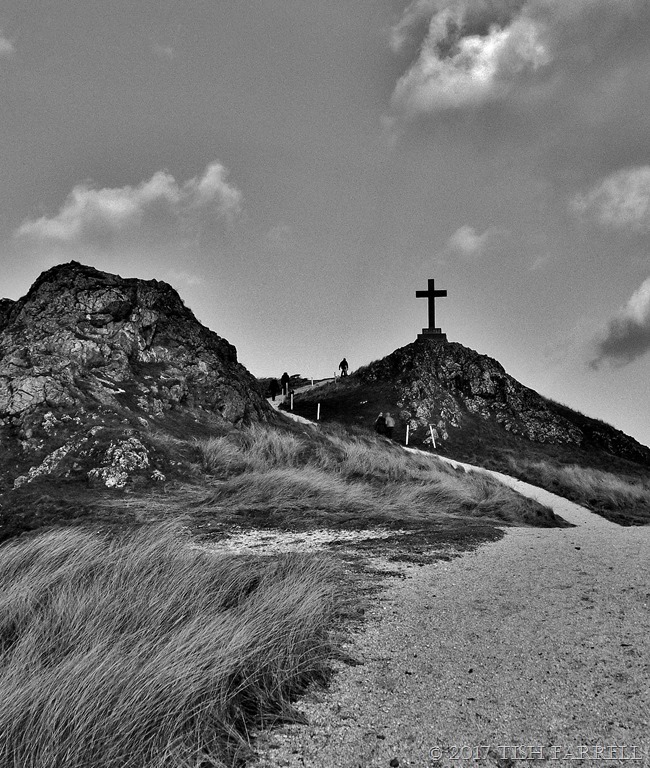 And it was here that St Dwynwen, daughter of a Welsh king, withdrew from the world to form a convent. This was in the fifth century, around the time that Roman rule in Britain was coming to an end. You can read her story at the link above, although there are many versions, and they mostly have to do with spurned or thwarted love, and so are used to explain how she came to be the Welsh patron saint of lovers. Her day is celebrated each year on 25th January. 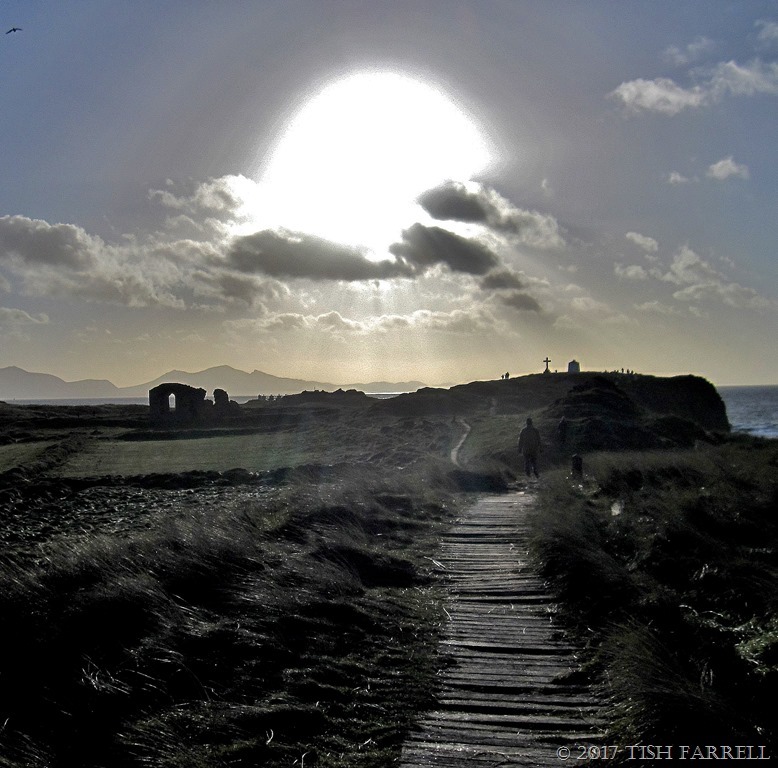 During the Middle Ages, as poets and pilgrims were drawn to Llanddwyn Island, so the accounts of their visits helped grow Dwynwen’s reputation for mystical powers of healing and divination. Even her well was said to be inhabited by sacred eels, and through the cunning reading of their movements, you might predict the future. On the other hand, if the waters boiled up during your visit you could be assured of love and good fortune. We, however, were not enticed from the path to see this for ourselves. A very pungent odour wafting our way suggested something had died there. Perhaps the sacred eels? Instead we took the cliff path and enjoyed the thrill of stepping out above a stormy sea. 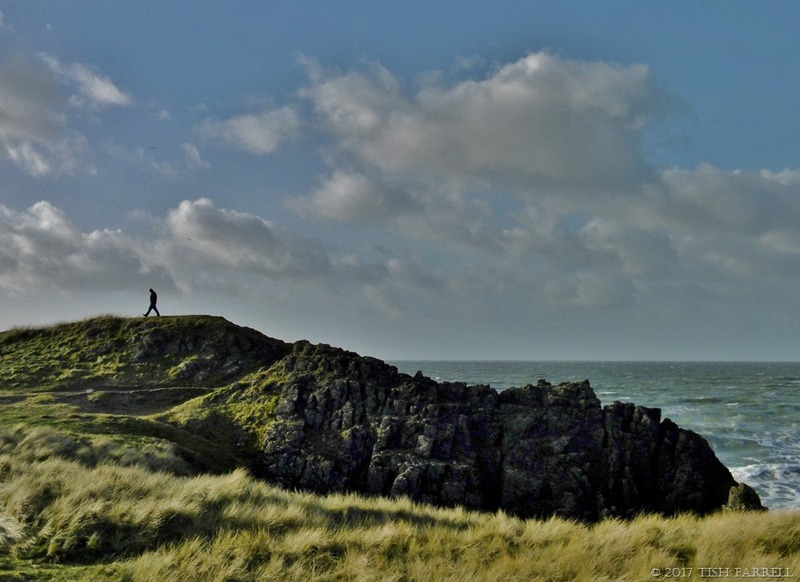 There is anyway much to explore on this small promontory. At every point, as the sea recedes, there are enticing coves – some rocky, some sandy. There are many man-made features too: a Celtic cross of nineteenth century vintage, another marking Dwynwen’s death in 465 C.E. There are the ruins of a Tudor church built on the site of Dwynwen’s own church which she apparently built herself from beach stones, and so doubtless did not stand the test of time and wild Welsh weather. 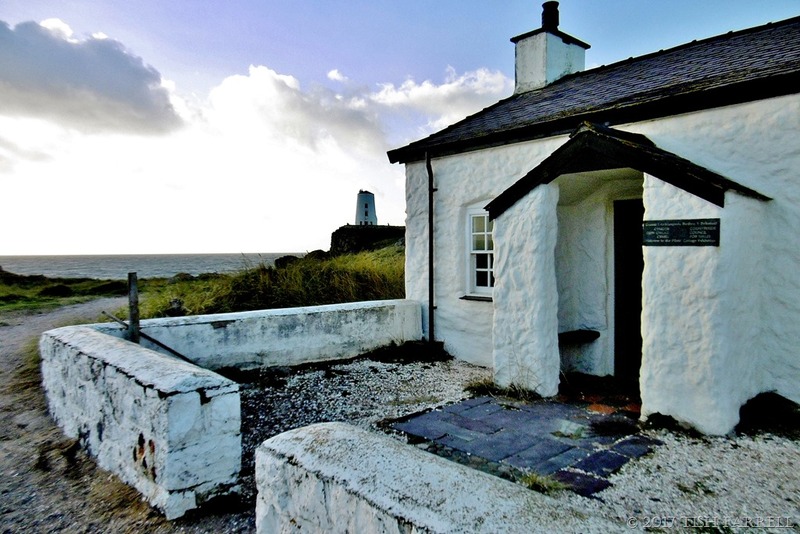 There is also a beacon, a lighthouse and three cottages built for the lighthouse keepers and their families. 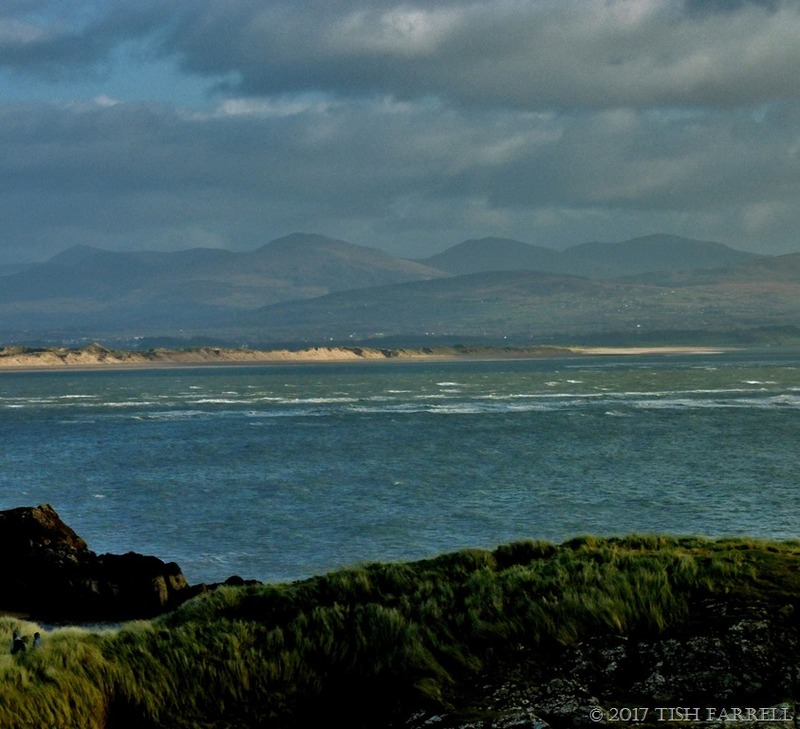 In the nineteenth century the export of Welsh slate was a thriving industry, and the lighthouse served the slate ships in particular, keeping them off the dangerous Menai Strait sand bars. On the long walk back up the beach, the wind was behind us. Now we were walking with the moving sand. But it was still a very odd experience. Some of you will have already read the essay below. It won first prize in a Quartos Magazine competition years ago. The magazine is no more, but I’m posting the piece again for those of you in need of a long, soothing wallow beside an African beach. Enjoy! It’s a dog’s life on Tiwi Beach, the white strand where ocean roars on coral and trade winds waft the coconut palms; and where, best of all, as far as the local canines are concerned, there are quiet coves sparse in holidaymakers. It means they may do as they please. After all, it is their own resort, and every morning they set off there from the beach villages along the headland, nose up, ears blown back in the breeze, ready for the day’s adventures. But the dogs are not churlish. 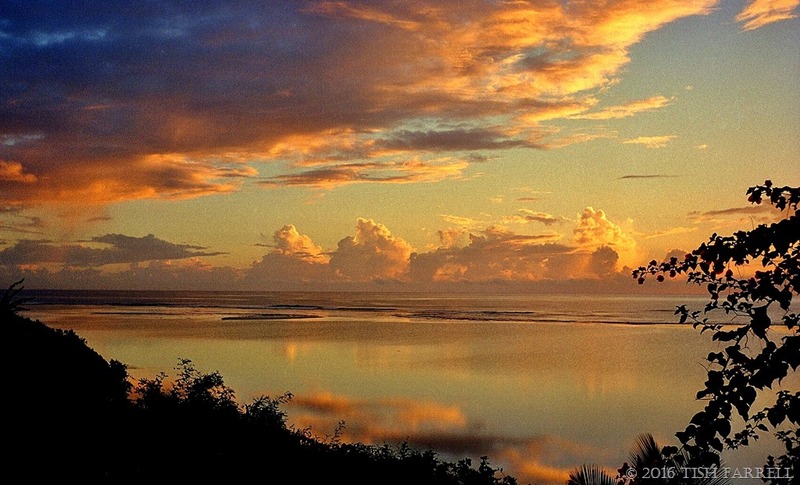 They can take or leave the odd pale human wrestling to right his windsurfer on the still lagoon; ignore the sentinel heron that marks the reef edge beyond; pay no heed to the etched black figures of the Digo fishermen who search the shallows for prawns, parrot fish, or perhaps a mottled lobster or two. But in this last respect at least, the dogs are smug. For the fishermen come down to the beach only to make a living. And when they are done hunting, they must toil along the headland from beach village to beach village, then haggle over the price of their catch with the rich wazungu who come there to lotus eat. Hard work in the dogs’ opinion. The dogs know better of course; know it in every hair and pore. And each morning after breakfast, when they take the sandy track down to the beach, they begin with a toss of the head, a sniff of the salt air, a gentle ruffling of the ear feathers in soft finger breezes. Only then do they begin the day’s immersion, the sybaritic sea savouring: first the leather pads, sandpaper dry from pounding coral beaches, then the hot underbelly. Bliss. The water is warm. Still. Azure. And there can be nothing better in the world than to wade here, hour on hour, alongside a like‑minded fellow. There’s not much to it; sometimes a gentle prancing. But more likely the long absorbing watch, nose just above the water, ears pricked, gaze fixed on the dazzling glass. And if you should come by and ask what they think they’re at, they will scan you blankly, the earlier joy drained away like swell off a pitching dhow. And, after a moment’s condescending consideration, they will return again to the sea search, every fibre assuming once more that sense of delighted expectation which you so crassly interrupted. You are dismissed. For what else should they be doing but dog dreaming, ocean gazing, coursing the ripples of sunlight across the lagoon and more than these, glimpsing the electric blue of a darting minnow? And do they try to catch it? Of course they don’t. And when the day’s watch is done, there is the happy retreat to shore ‑ the roll roll roll in hot sand, working the grains into every hair root. And if as a stranger you think these beach dogs a disreputable looking crew, the undesirable issue of lax couplings between colonial thoroughbreds gone native: dobermanns and rough‑haired pointers, vizslas and ridge‑backs, labradors and terriers, then think again. For just because they have no time for idle chit-chat, this doesn’t make them bad fellows: it’s merely that when they are on the beach, they’re on their own time. But later, after sunset, well that’s a different matter. Then they have responsibilities: they become guardians of the your designer swimwear, keepers of your M & S beach towel, enticing items that you have carelessly left out on your cottage veranda. By night they patrol the ill‑lit byways of your beach village, dogging the heels of a human guard who has his bow and arrow always at the ready. And when in the black hours the banshee cry of a bush baby all but stops your heart, you may be forgiven for supposing that this bristling team has got its man, impaled a hapless thief to the compound baobab. It is an unnerving thought. You keep your head down. Try to go with the flow, as all good travellers should. But with the day the disturbing image fades. There is no bloody corpse to sully paradise, only the bulbuls calling from a flame tree, the heady scent of frangipani, delicious with its sifting of brine. You cannot help yourself now. It’s time to take a leaf out of the dogs’ book, go for a day of all‑embracing sensation ‑ cast off in an azure pool. And in the late afternoon when the sun slips red behind the tall palms and the tide comes boiling up the beach, the dogs take to the gathering shade of the hinterland and lie about in companionable couples. Now and then they cast a benign eye on you humankind, for at last you are utterly abandoned, surrendering with whoops and yells to the sun‑baked spume. They seem to register the smallest flicker of approval: you seem to be getting the hang of things. In April at The Earth Laughs In Flowers, Jude wants to see our garden macros. This is also the Day 5 of the 7-day nature photo challenge. 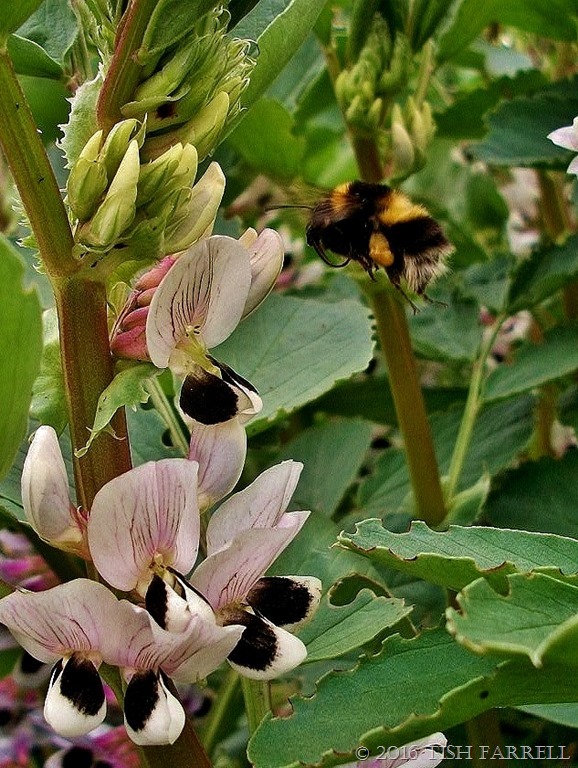 So here we have a bumble bee heading for my field bean flowers. I don’t blame it. They smell divine on a still, spring day. This photo was taken up on my allotment, probably last year. At the moment the current crop of field beans, sown in September-October and overwintered, is only a hand’s width tall, but they’re looking quite healthy. Once they get going, they will grow as tall as I am, and need some support. The photo also shows bean weevil damage on the leaves. This is one of the drawbacks of allotment gardening. Pests like this become endemic. On the whole, though, the beans seem to carry on regardless. Field beans are related to the broad bean (aka fava or faba) and they look much the same, but are less than half the size. Mostly they are grown in the UK as a green manure, the plants dug in before flowering. I grow them to eat. They make great re-fried beans, soup and a bean version of guacamole, which is astonishingly good. My crop was so productive last year, I was able to eat and freeze them, and save masses of seed to dry and sow for this year’s crop. It’s the first time I’ve done this, so it will be interesting to see how they turn out. In consequence, I probably have grown too many. But once I see how the plants are faring, I shall sacrifice some of them. I mean to chop them down and leave them to rot on the soil surface, rather than digging them in. This will let the worms do the work, and keep the soil covered until I want to cultivate it. I am beginning to see that digging is a very bad thing to do the earth. It wrecks the surface soil structure every time you do it, and so compromises fertility. Instead, the No Dig method relies on covering the soil surface with organic matter/compost every year, and then planting through it. The only problem is you need masses of compost. It also helps if you do your planting in raised beds. This way you do not walk on the soil, and can keep building up the fertility. Raised beds are easier to manage, and mulching the plants should massively cut down on the weeding, and the need to feed, or to water during dry spells. Since last autumn I have been doing heavy labour on the new allotment plot that came with my polytunnel. (I hadn’t taken this into account when I got all excited about inheriting the tunnel from allotmenteers who were off to new territory.) The ground all round was heaving with dandelions and buttercups. And since this was before I discovered the no dig approach, I admit to using the quick and dirty method (though NOT weed killer) and slicing off the top layer of weeds, and dumping it in compost bins to rot down for a few years. The ground zero method of gardening. I then commissioned He Who Does Not Garden But Lives In My House to construct and install on my plot several raised beds made out of recycled builders’ yard pallets. A couple went into action straight away, and were planted up in October with over-wintering onion sets. The others I have been filling up over the past few weeks. So far the onions are looking healthy and a few weeks ago I sprinkled organic hen manure pellets over their beds, an alternative to sulphate of ammonia, which I didn’t have to hand. By now you will be beginning to grasp the lengths that this writer will go to in order not to sit in front of her computer and cultivate the master work. So far I have shifted around 30 barrow-loads of an old garden rubbish heap that has apparently been in the corner of the allotment for the last forty years, and until recently was covered in brambles and nettles. Strangely too, it was my idea to recycle it. Off course when I say heap, I really mean small mountain. It’s full of bonfires past, rodent nests, and decomposed leaves from the nearby ash tree, as well as nearly half a century of weeds and waste. There’s also broken glass, bits of plastic fertilizer bags, and all sorts of unidentifiable metal items that gardeners of yore thought could be disposed of in such a manner. As I sift through the heap, I think how good it is that I’m putting the field practice of my long ago archaeology degree course to some sort of use. In fact I have been keeping an eye out for old coins, remembering that a few years ago I uncovered a 1725 halfpenny right outside my shed door. It helps to keep me amused during the boring process of extracting unwanted detritus and plant roots. 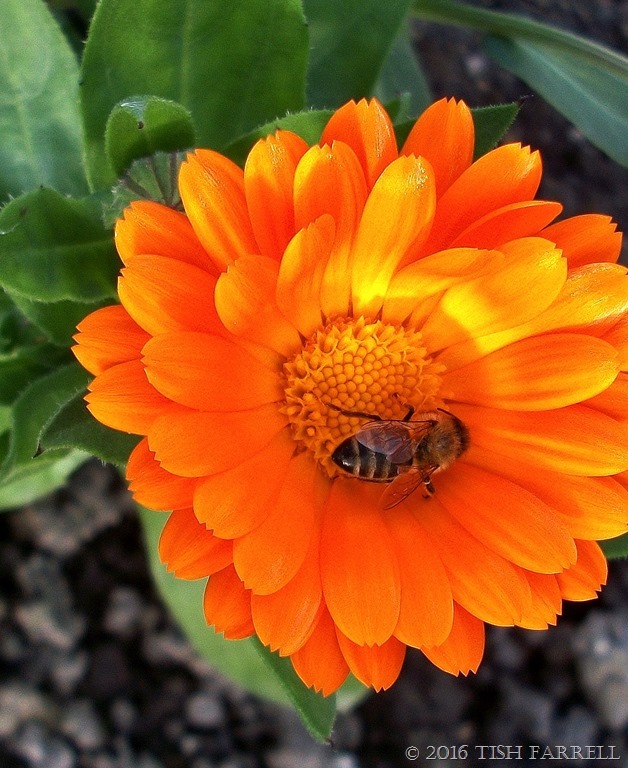 I’ve also filled myself with a big enthusiasm infusion by deciding to dedicate one of the raised beds to growing flowering annuals to attract more bees. I shall also use it to grow on perennials (verbascum, heleniums, echinops) and biennial foxgloves that I’ve just germinated on the kitchen window sill. The thought of a raised bed bursting with summer flowers is so heartening. Doubtless you will see the results as time goes on. But for now that’s enough talk about gardening. The sun is shining, and the weather forecast tells us we have a brief window of opportunity before the rain returns, so I’m off to the allotment with my pea and beetroot seedlings. I may even sow some parsnips. Happy Sunday one and all. I had been wondering to myself whether I would post some of my Africa pix for the nature photo challenge, and thought I probably wouldn’t. Then the ‘Landscape’ challenge cropped up, and so here I am, killing two birds with one shot. Or it might be two. 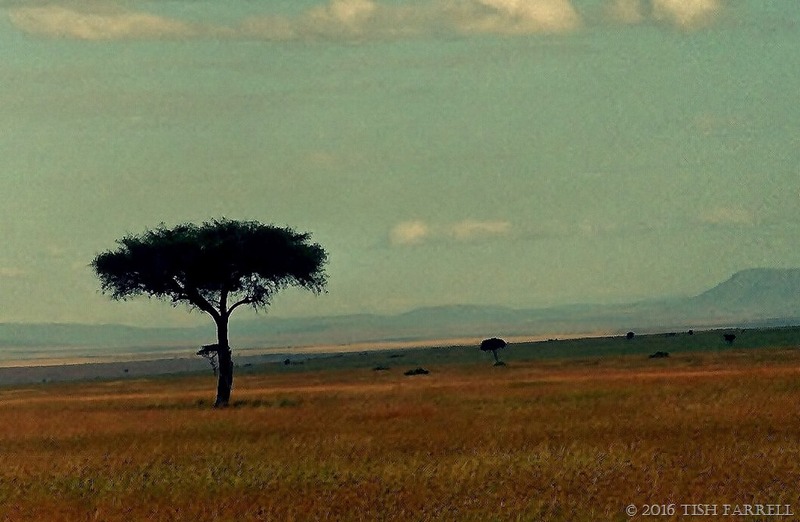 Also, for whatever reason that has nothing much to do with me, post editing or anything, this view of the Maasai Mara (edge of the Ololo Escarpment to the right, desert date tree to the left) has acquired the look of a painted landscape. I think it was probably taken at dawn, out on game drive from the Mara River Camp, one of the last places we stayed before ending our eight-year life in Kenya and Zambia. The desert date (Balanites aegyptica), much like the baobab, is one of Africa’s treasure trees, and has multiple uses. It grows in the driest places across the Sahel and savannah regions of the continent, and fruits in the driest of years. It is thus highly valued by nomadic herders since both fruit and foliage provide useful forage for camels and goats during times of drought. Also a nourishing and restoring skin oil can be made by milling the fruit, its cosmetic and therapeutic qualities long known of by the Ancient Egyptians. (Samples have apparently been discovered amongst pyramid grave goods). And you can buy it now. Fair trade producers in Senegal, West Africa are producing the oil commercially. Other traditional uses include making fish poison from the bark, and using the termite resistant wood to fashion farm tools. Better still, an emulsion can be produced from the fruit – harmless to humans and warm-blooded mammals (Trees of Kenya Tim Noad & Ann Birnie: 27) and used to clean up drinking water supplies. It kills the freshwater snails that carry bilharzia, and the water fleas that carry guinea worm, both causes of distressing and debilitating diseases in many parts of Africa. The continued existence of this tree is also related to the continued existence of elephants. In the wild they are the main conduits by which seed is processed and made ready to plant. Having passed through the elephant’s digestive tract, it is then conveniently deposited in its own dollop of manure. Another example of how all in the natural world is intimately connected, and we kill off bits of it (stupidly thinking they don’t matter) at our peril. 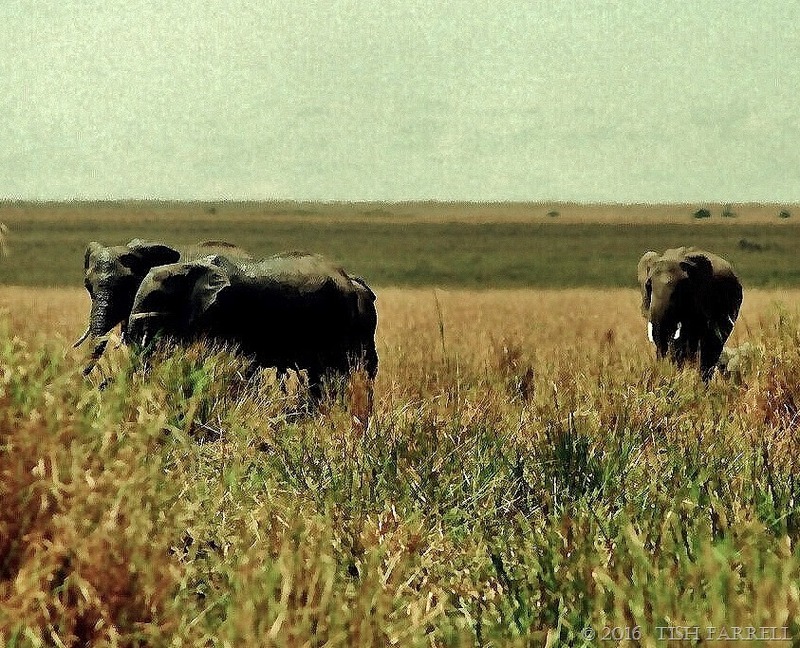 Elephants at high noon beside the Mara airstrip. You can see the green tops of desert date trees above a gully in the distant heat haze. Anna at Una Vista di San Fermo invited me to join the 7-day Nature Photo Challenge. This is my Day 4. Please also go and see Laura’s magnificent dragonfly at Eljaygee, and Sue Judd’s elegant study of daffodil decay at WordsVisual, and Gilly’s absolutely mega termite mound at Lucid Gypsy. It stills the mind, listening to the sea. The chattering monkey mind shuts up. Gives in. Surrenders to the inward rush of waves, the rhythmic retreat. But add in the doleful wail of a lighthouse foghorn, and something else happens. A door in the imagination swings wide: images of storm-lashed fishing boats, a ship off course, the warning blast resounding on fog-laden seas, the tremors of anxiety as seafarers hear that sound and know of invisible danger ahead. Shoals, sandbanks, submerged rocks? There was none of this kind of drama on the day we went to Portland Head Light. The morning’s sea mist had dispersed to dreamy afternoon sunshine. We watched a huge cruise ship sail out of Portland. People milled about the gift shop and ate ice creams. 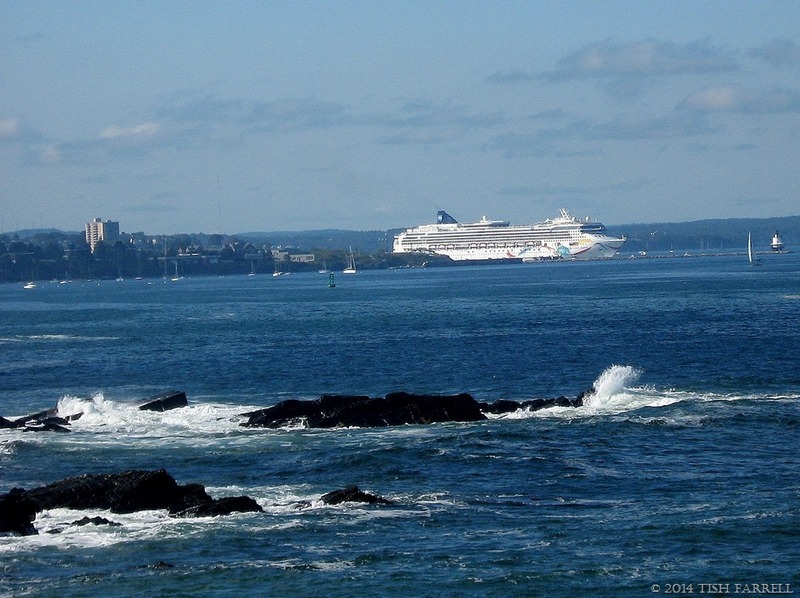 September in Maine – what could be nicer? 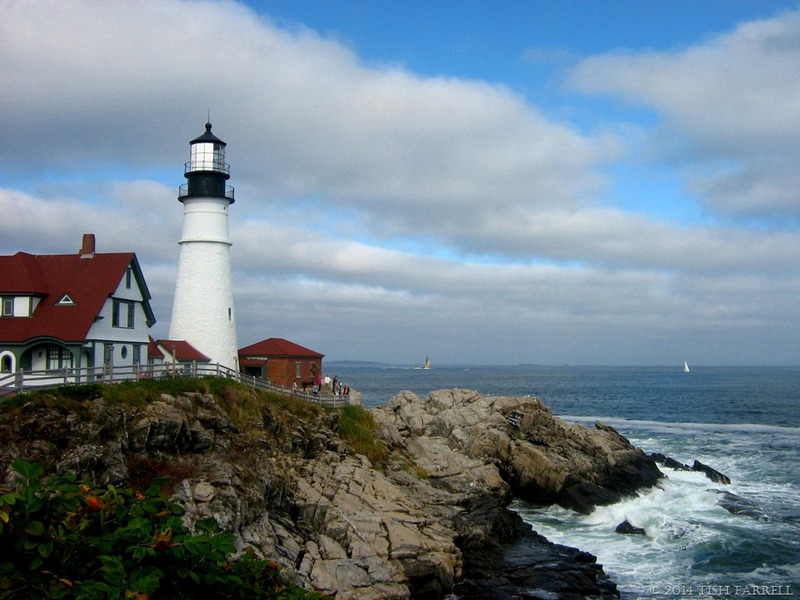 The Portland Head Light is the state’s oldest lighthouse, built at the behest of President George Washington between 1787 and 1791. Apparently government funds at the time were very tight and the story goes that the President ordered the masons, Jonathan Bryant and John Nichols of Portland, to use materials taken from the fields and shore and haul them to the site by oxen. The original plan was for a 58-foot tower (17 metres), but when it was done it was realized that the light would not be visible beyond the headlands to the south. A further 14 feet (4 metres) was required, at which point Mr. Bryant quit, leaving Nichols to finish the job and build the small house beside it. The Light was dedicated by the Marquis de Lafayette and first lit on January 10 1791 using 16 lamps fuelled by whale oil. The first keeper was Captain Joseph Greenleaf, an American Revolution veteran. 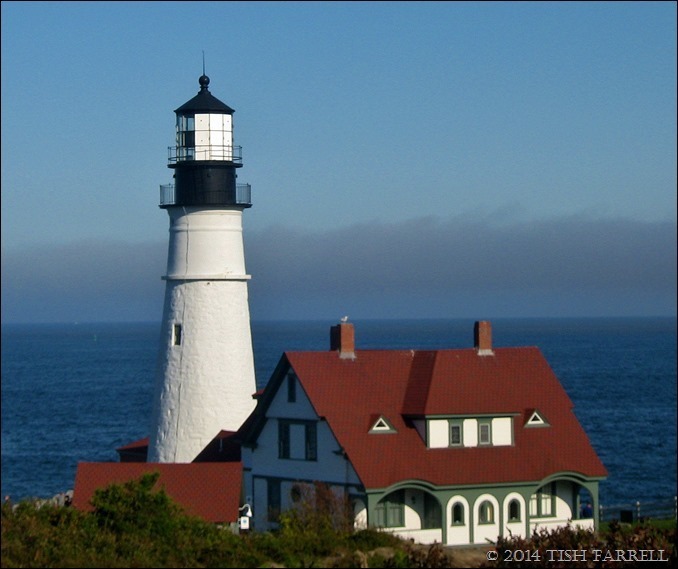 For his pains of manning the Portland Head Light, Greenleaf was allowed to live in the keeper’s house and fish and farm nearby. He received no pay. By June the following year he had had enough. He wrote to the authorities telling them of his travails. For one thing in the winter the ice would form so thickly on the lantern glass it obscured the light, and he would have to go up there and melt it off. It is hard to imagine what kind of effort this would have involved, and in alarming conditions too. In 1793, until his death two years later, he received an annual salary of $160, which by today’s values would be around $4-5,000. Not exactly riches for saving life and property from treacherous seas.